Last weekend was a very full weekend, one that left us a little too tired come Monday morning... but in a good way. Thursday was Caleb's birthday, which we celebrated by giving him little gifts during the day, special cookies and dessert, steak dinner, balloons for balloon fights and a new guitar. He is 13. Am I really old enough to have adolescents? Yikes---time flies. Which is why we are here, in Florence, to soak each other up before time gets away from us. Saturday night Anthony went to a birthday party, at the home of a classmate some 30 minutes from Florence. James drove him there, and memories include long conversations for James in Italian, dancing and itunes for Anthony and fabulous hosts who sent them home with wine and olive oil. Caleb and I stayed home, set up our Christmas tree with lights, relaxed and watched a movie. James and Anthony were in bed just shy of midnight and up again just after 6am. (Somewhere in here, we need to appreciate James riding a bike back and forth around town to rent a car. And I really do mean 'around' since you cannot drive a car in the city without a special residential permit... if you do, months later you will find unkindly tickets in your mailbox---compliments of the electronic police cams). 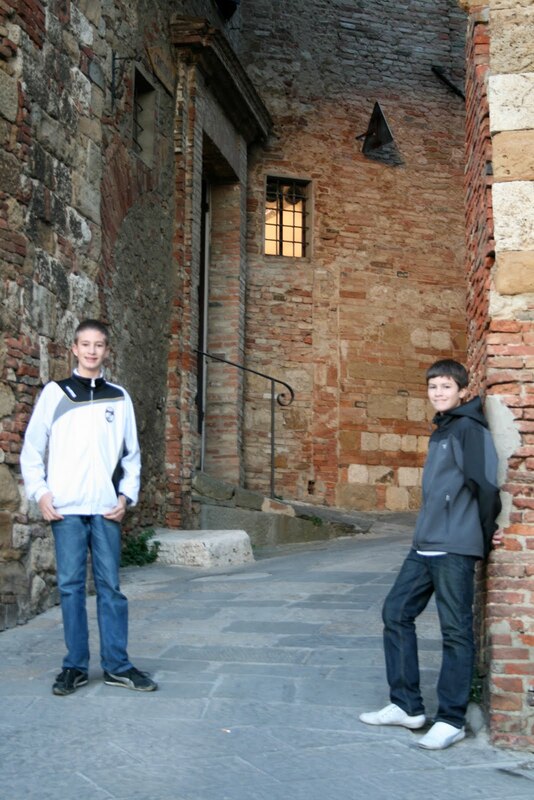 James dropped Anthony off at an early bus, so he could ride with his team to a game in Montepulciano. Caleb, James and I drove to Montepulciano for Anthony's game, then went out to lunch with the team. It was a classic Sunday dinner, where you sit and receive course after course until you are absolutely bursting. We did not anticipate this long meal and bursting stomachs... I felt like I had just eaten Thanksgiving dinner. No the Italians don't eat like this every day, but sometimes they do on Sundays. And we ate and ate and ate; I reached for my TUMS as soon as I hit the car. Wine and water (coke for the kids) were the beverages; the meal started with bread and oil, then rounds of bruschetta: 5-6 different varieties served with a token slice of salami or prosciutto. I thought: this is nice, some bruschetta (tomato, white bean, artichoke, olives, another pate-like paste), sliced meat and wine. Perfect for lunch. Because that would have been just about the right amount for one or our midday meals. How wrong I was---and how I would have paced myself: bruschetta was followed by pici (pasta well-known in this region) with meat sauce, then ricotta and spinach stuffed ravioli with mushrooms, roasted chicken, sliced pork, potatoes, fries, salad... and espresso and tiramisu. And people finished whatever was on their plates. Halfway through I noticed whatever people took on their plate, they finished. So I began declining full portions by the end: too little too late. Wowza, Thanksgiving came early this year. Aren't you full just hearing about it? After the long lunch, we departed to take quick peeks at Montepulciano (a brisk walk around the city, inside the cathedral and a perfunctory purchase of 2 bottles of wine). We snapped some twilight pictures and promised ourselves we would return. 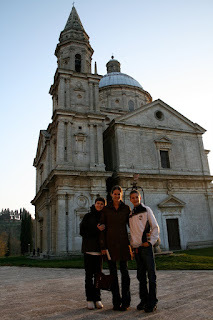 We took [typical] narrow, curvy roads to Pienza, just 10k away. A tiny little town, with narrow stone paths, piles of stores offering tastes of Pecorino, a humble church and a restaurant recommendation (for next time: Bucca della Fate). It was late, so we bought some cheese, salami and bread and hopped in our car to go home (we were still far from hungry!). Today really is Thanksgiving. Although celebrating with just our family of four, our table will be appropriately bursting with turkey, potatoes and gravy, rolls and apple pie. I will make a little stuffing and roasted brussel sprouts... and because we are in Italy, I am adding: squash risotto, wine from Montepulciano and fennel into my stuffing. We will no doubt, be bursting. And not just with food---but with thanksgiving. We feel so fortunate to have this opportunity abroad, to have all this time together, and to be filling our minds and hearts with countless memories. Again, I just love reading about your fabulous Italian adventure. Love the pictures and the details of the food (groan! so much food!) and the wonderful tales of frolicking Fridays!